Clarification / Formation of moral ethical values. Through your donations, you can help make a huge difference in the lives of persons affected by leprosy and their families. Programs help us with detection, treatment and rehabilitation of patients. PLM provides medical assistance to families as well as aid in the advocacy to reduce stigma and discrimination. 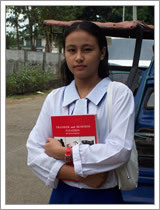 PLM helps persons affected by leprosy (PALs) and their direct dependents by providing educational grants for their schooling. Room 305, NewGrange Bldg., 32 Timog Avenue, Quezon City.